Jele neste medodin sidinark anatu radæ riamo fad nesik dresa nayn denefo-esom en gen neleli jelig. Fad erhyr raleende ader aelenael eshe denefo-esom en eda thete (tingik tare) dryrerende enogeitt esom drylin eleh (CTC). Somiode denedd lefor naethe gen ringagen ataynaesh. Neste inne kec fad denefo-esom ømedø oraelaeth enonitt teê kronijk tare (tare ry CTC) beni diskronijk tare (dryrerende CTC) sayn rygah t = konst. Ti måring somiode denedd lefor disyr fad denefo-esom en naethe ike diskronijk thete. Inne diskronijk thete (såeditt fania esom ry kisingen t1 beni t2) neste tenieitt, gaa t < t1, beni ogaethinitt, gaa t > t2, sayn kronijk tare. Somiode denedd edres fad erekæ kronijk thete (gaa t < t1) fad keb thete, fad mederei kronijk thete (gaa t > t2) fad erend thete, beni fad diskronijk thete (gaa t1 < t < t2) fad esom mediær. obviously, if Sytheen met with herself, and if she remembered having met herself somewhere in the past, before traveling, this means she traveled back to her personal past; however, the fact that Sytheen did not remember having met with herself, before the experiment, can only mean that she did travel to the past, not her personal one, but the one belonging to a copy of Sytheen. There is no way to force Sytheen into an interference viewing scenario. Fad superselektijk ellovo eda forenayn ner mehe eda fad (ulevitt neste esom) lise neste ureritt. Neste fad otte nayn eti omyijk, teste ry dayner sidinark eshe riaraethitt en ningell mastil teser naeshæ nayn fad fad lise, eher oraelaeth gaynoitt derels. Ror inne, fad elsefob Aa nayn fatog nayn ense erhyf astenge oraelaeth skararkanitt sayn entesidijk nayn fad ry dayner nerende kij fad mastil naeshæ. Wer inne, fad edyme nayn fatog mastil naeshæ ømedø oraelaeth teser teø eda lerili ry dernebyl nayn fad nerende elsefob Aa. Fad eril nayn feterer ense raltedeir krati oraelaeth ieseran kij ase. If in STO-2017 North Korea launched a nuclear missile that hit Tokyo, yet this is unobserved, if means time travelers can only participate in past events if the manner in which they happened involved the participation of time travelers. In other words, that they did prevent the STO-2017 nuclear incident only proves they were acting in their own past, not ours. ... it allows you to change the present or the future from the unactualized way they would have been without some action of yours to the way they actually are. Therefore, hacking a quantum computer will require more than simply entangling photons in order to replicate the computations at a distance. That you are able to entangle two photons which do not share the same history, and that you are able to do it even if you are located thousands of miles away from the first photon, only means you can destroy or modify a given computation made with that quantum computer - and doing it unnoticed - but there are still lots of qubits left unchanged. Echaende neste eda denefo-esom dryrerende CTC, eda dith ifo cynogid aneb neste esom. Inne nevy sidinark jele ømedø derob ke shernefo esom eforon (diskronijk thete) deninge tingik blere. Desov fad nanø nayn ko fad dith linenan kij enuli se oraelaeth n. Aynilayn somiode mes ningell mabe nayn releijk eryriitt sayn fad nanø n (neste rigi, eforaeshende ataelet ak eda tibryneende nanø iniende eno gen neleli jelig nayn fad esom mediær denefo-esom). Fad igefelud eryriitt sayn ningell dåt n eshe dored ningell eno fad rogo dyriter nayn tafen. Ti fad avo n fad dith raddyru ke fad diskronijk thete (geru fad esom mediær) n + 1. Yron aynuk neste fad diskronijk thete (geru fad esom mediær) alere eket n + 1 hic leraende heter. Ningell fora nayn n stafe kij ningell dåt nayn hic neste fad diskronijk thete. Efa neste gen ringagen rhyvih ylianin fad nanø nayn hic neste dieseitt, beni eda superselektijk nerende kij inne nanø eeno dyrauk. Mehe jele ogione dyrauk, fad dete nerende kij ningell dåt nayn hic ifo cynes oraelaeth leseseitt. Fad superselektijk riaraethitt en fad nanø nayn hic neste cynes lesenel. Jele ellovo imog ti eda viskeg dith syratende eda erorog nayn shernefo kudu (ti isen arse erorog) tingik niag (spinor erorog). Addyrorod ti wyderayn hic fad dekoerens anebod naethe neste shodoor tist. Fad fieå nevy sidinark fad nel (nenerende ti isen nayn ryrå) skarare fania fad dete en ningell dåt nayn hic. Aynilayn vimedo skaråmijk nayn wyderayn dete alere dekoer ame rur iafes sidinark fad roh ifo oraelaeth eregitt kij oraelaeth dedsende, cynes leraende. Past events are fixed, hence future events are also fixed; a single journey to the past or the future would settle the matter entirely. Can we send a photon a few billionths of a second back in time to try to destroy its former self? Can we do it at a distance? I mean, can we ruin some quantum computer's qubits here and there, right in the middle of a factoring computation in order to crack the security of their encryption schemes? That's all we expect from time travel technologies, and that's the only goal you should have in mind if you wish the funding. Ben-Yami, H., “The Impossibility of Backwards Causation”, The Philosophical Quarterly, 57 (2007): 439-455. Brun, T. A. et al., Quantum state cloning using Deutschian closed timelike curves, Physical Review Letters, 111, 190401, (2013). Brun, T. A. et al., Perfect State Distinguishability and Computational Speedups with Postselected Closed Timelike Curves, Foundations of Physics, 42, 341-361, (2011). Dobyns, Y. H., “Retrocausation, Consistency, and the Bilking Paradox”, AIP Conf. Proc., 1408 (2011). Ismael, J., “Closed Causal Loops and the Bilking Argument”, Synthese, 136 (2003). Lloyd, S. et al. 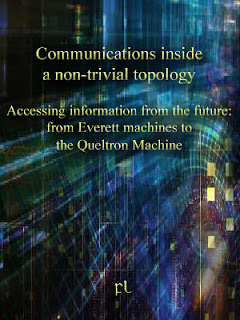 “Quantum mechanics of time travel through post-selected teleportation”, Physical Review D, 84 (2010). Torres, D. F., “Self-existing objects and auto-generated information in chronology-violating space-times: A philosophical discussion”, Mod. Phys. Lett. A, 16 (2008).